Creamy peanut butter icing gets is fluffiness and smooth texture by starting with canned icing. Just add peanut butter, a bit more butter, and some milk or heavy cream, and whip it into a cake frosting no one will ever forget. Peanut butter icing is another one of those recipes my mom made all the time. Originally, this post was supposed to be called chocolate cake with peanut butter icing. It is a comfort food for me. My mom was making this long before it was a trendy “new” idea. One time, we went to my grandma’s house for a family dinner. We left the house in a rush and the chocolate cake with peanut butter icing got left behind. We were too close to Grandma’s and too late to retrieve it. When we got home that evening, the cake was missing…….. Cakes don’t normally grow legs and walk through the front door. Later the same evening, the cake was found in the family room, half-eaten sitting next to the telephone. Apparently, even thieves like this combination. 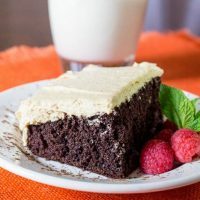 Even though the story and post are about chocolate cake AND peanut butter icing, I didn’t want to mislead anyone into thinking there was some spectacular chocolate cake recipe lurking deep inside this post, because there isn’t one. Any chocolate cake recipe will work here. One from a box is what my mom always made. 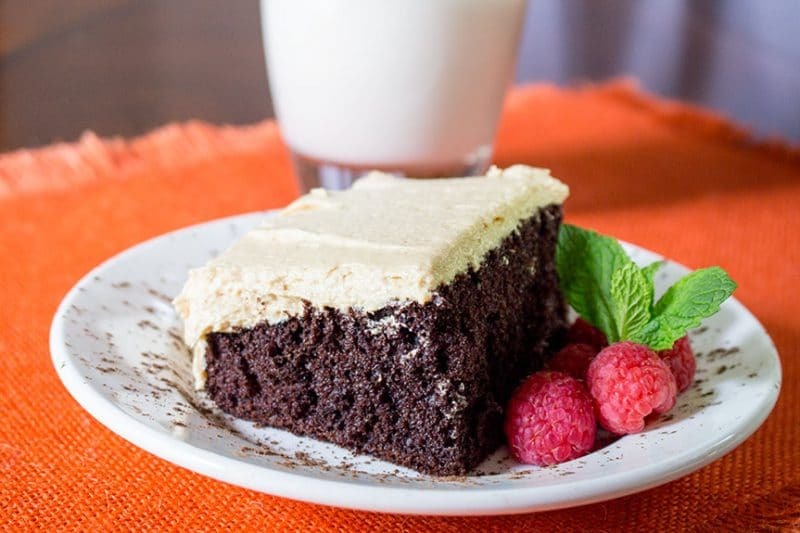 Devil’s food or dark chocolate cakes are my favorites to pair with this icing. You could also eat this with a spoon, a finger, a spatula, heck even chopsticks. I might have licked the spatula between photos…….. This has become somewhat of a traditional family recipe for us. Ron likes to have it for his birthday cake. Erica (bless her little kitchen heart) likes to make it for her brother sometimes and peanut butter icing was one of the first recipes Sam ever asked me for. I was embarrassed to give her the recipe because is it so simple and actually starts with a can of vanilla frosting and gets plopped on top of a cake made from the box. Place canned frosting, 3/4 cup of peanut butter, and butter in the bowl of a mixer, or a mixing bowl if you don’t have a stand mixer. Mix on medium until no streaks of peanut butter or icing remain. Taste. Add up to 1/2 cup additional peanut butter for a stronger peanut butter taste. Once the desired level of peanut butter flavor has been achieved, add milk and beat on until it is light and fluffy. More milk can be added for a softer consistency. Nutritional data is for Peanut Butter Icing only. Hands down the best recipe for anyone who loves peanut butter. Just one tip: skip the cake. just eat this with a spoon.